There is so much “extra” that goes into completing an outfit, especially with vintage styles because that can include a bunch of things that are overlooked today. This might include gloves, jewelry, hats, and even more hidden and not so noticed items such as lingerie…proper slips and the like. Necessary, matching underclothes and accessories often came with vintage garments originally, yet, most sadly, a large number have these items missing today. There must be some mysterious gremlin or just some badly run estate sales which misplace those matching slips for vintage sheer dresses, or those self-fabric belts which somehow are sadly missing to complete an outfit! Perhaps their former owners wore such items to death and they didn’t survive. Anyway, this leaves one who can sew plenty of extra work to make items that will not be seen and be underappreciated (as a whole), yet just as necessary to bring a vintage original piece back to life. What cannot be seen doesn’t mean it is not important. Take this lovely vintage late 50’s or early 1960’s dress which came into my possession. All I got was just the dress. Now, I am not in the least complaining! It fits me, is in perfect condition, has wonderful details, and has my favorite colors. However, it is missing its belt and definitely needing more than just your average slip to be complete it. Now, the ‘trick’ of a classy, ladylike sheer dress is to be revealing yet not show enough to look like a tart. So, that opacity which is needed can be an opportunity for fun – you can make that slip naughty, add whatever details or go basic, and even have fun with the color. What is great about making an underslip is that, firstly, it is all about you – it is the most indulgent selfish sewing which is still justified because of its necessity. It is all for your viewing (unless you post a picture of it) and your intimate wearing. Secondly, I love the irony in that you are wearing it but yet it is both seen and yet not detected! Such little things as a slip or a belt is also a great way for one who sews to make a little extra effort and both put your personal touch on a vintage piece and restore it at the same time. After all this chatter, what I did make to go under my vintage dress was a deep burgundy-tinted purple satin crepe slip. Any shade of purple is my favorite color, but I love the way it prevents any see-through and adds an interesting tone of color to the sheer dress over it at the same time. I do like going darker than lighter with my underslips (as I did for this 1930’s dress) – it makes the dress more obviously sheer yet still highlights your underwear discreetly. The print on this vintage dress is so busy you can’t notice the dark slip here, though. The funny thing is, that on its own, my slip actually looks like a sundress to me. It has nice details, but it still is rather basic overall and provides full lingerie coverage. Oh well, I wanted something that rather looked like a dress actually because I had other plans for this slip. There is another sheer outfit – one that I will post in the coming months – which I like wearing over this slip as well. The neckline on this outfit is a deep V, so I want the slip to fill in the décolletage for me. I love making one piece become a useful, working staple in my wardrobe. Already this slip has proved its worth and is used more often than I had imagined. Yay – so many times the simplest projects are the most useful. FABRIC: For being a polyester, this fabric is soft, flowing, and very good quality. It has a darker, more burgundy color satin side, and a lighter, purpler buff crepe side. I used the satin side facing out on my slip. This is the second time I am using this fabric – the first time was to make the ‘pocket’ flaps and the belt for my 1955 Redingote jacket (post here). TOTAL COST: as this was clearance fabric, and I only used under two yards, this is a $3 slip. Just a few posts back I mentioned that circa 1951 is one of my new favorite time periods for fashion…well here’s another one to add to that count! This slip does have a classic 1950s “New Look” shape of the times to it with the full skirt and trim waistline. I’m supposing the cover drawing is slightly deceptive the way the woman is so tall and the skirt is so full. I have to wear a poufy petticoat, but without that I would have to sew horsehair braid to the inner hemline to get my version to actually copy that image. Many times the idealism on drawn envelope covers makes us think our projects will turn out differently than they really do…but that’s okay to a point for me – we all love a good and glamorous pattern image, but the line drawing to a design are the meaty reality at the end of it all. There is a waistline zipper in the side seam – there was no other way to get that trim waist shaping. A zipper in the side seam of a slip seems really odd today, doesn’t it?! I learned from sewing this 1940s slip that such a closure feature isn’t really a problem until I wear another garment which also has a zipper on the same side. A zipper on top of a zipper is not comfortable. This was the 50’s though – fashion was above comfort. My Grandma has told me the corsets from that time were torture. At same point I might re-install my slip’s zipper on the opposite – the right side – as clothes so that there is no overlapping. It feels odd when I get dressed to find my zipper on that side but it turns out better for the overall comfort of wearing. This is not the 50’s anymore and after all this is my sewing, so I am darn well going to customize it however I’d like! The bust shaping here was also definitely tailored for a 1950s bra, maybe even a bullet bra or one-piece corsetlet. There was sooo much extra room! I brought a lot of the extra in by sewing a much larger seam allowance in the top half of the center bodice seam. Otherwise, the little trio of radiating horizontal tucks did a fine and unusual job of allowing room for the bust. I have seen this manner of shaping once before on the Simplicity #8252 (originally #8270 from 1950) but the reissue has French darts, too, which my slip dress doesn’t have. Advance patterns have funky sizing issues in my experience, so as much as I wanted to make the sheer dress from this pattern, too, I felt that making the slip first was a good way to test out the proportions. Many Advance patterns run small, and this one kind of held true to that. The overall length (unhemmed) was evening length (remember how I said the cover drawing made the model too tall?) and the bust was generous (expected because of the lingerie popular for the time) but otherwise the waist was inhumanly small. I sized up for the waist and hips for this slip from looking at the pattern tissue on me beforehand. It’s a good thing I did, otherwise this would not been a success…only a headache to fix. Now I know what to expect when I make that wonderful sheer dress that is the rest of the pattern. From the best estimating I can do, I am guessing that my slip is a bit early for the actual dating of the true vintage dress that I wear with it. 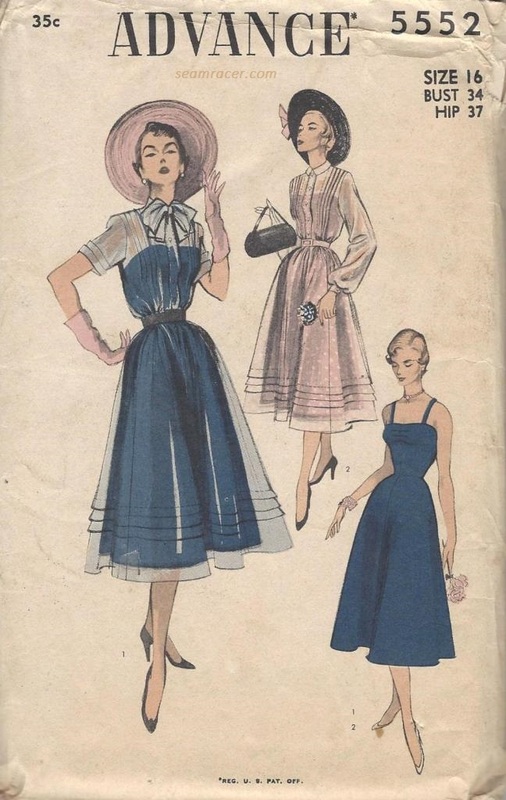 As I mentioned in the beginning of my post, I am estimating this dress is late 50’s or early 1960s after finding a few sewing pattern covers and fashion photography images. There is a year 1958 Simplicity #2411 pattern with a similar back neckline drape, kimono sleeve, and rounded neck. There is an unidentified late 50’s Butterick with an even more exact back neckline sash drape. However, the closest and classiest look-alike to my vintage dress is actually from Nina Ricci of 1960 – this has a similar silhouette and fabric colors and print. However, my dress has a label of “Marcy Lee of Dallas, Texas”. 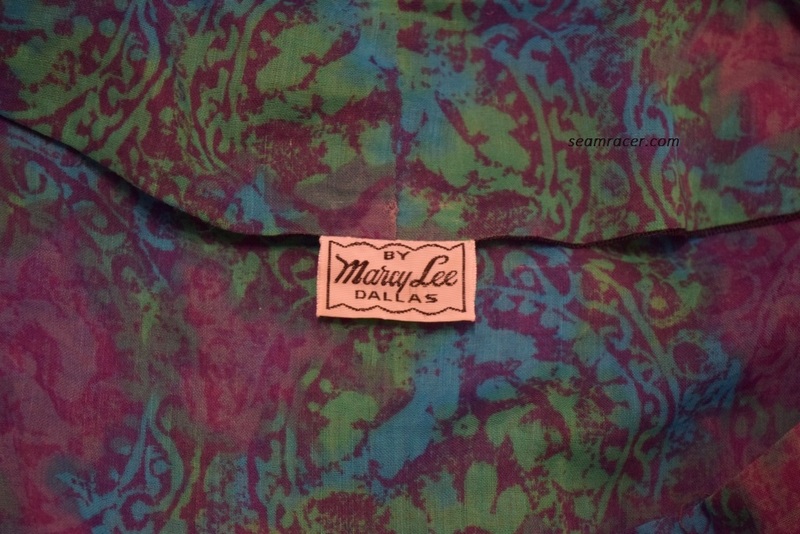 Marcy Lee was one of the over 100 blossoming clothing companies that began in the mid 1930s (circa 1933, actually) of Dallas, and this line capitalized on the marketability of low-cost cotton housedresses (info from here). For being an affordable “housedress”, this is still a lovely dress, with amazing details, a classic style, and appealing design. I really can’t say the same about the cheap and basic cotton knit clothes that are sold today! Even though this dress is made of the most delicate cotton gauze, somehow it still was made well enough to hold up all these years so I can wear it today. The details to the closing of this dress gave me the inspiration to adapt my own sewing. 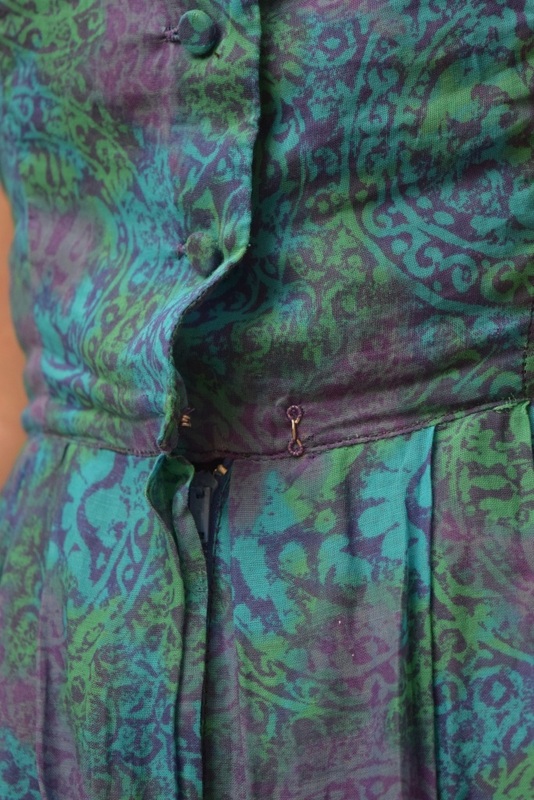 When I was making my 1951 wide collared dress and I couldn’t figure out a front closing method to replace the side zipper, I used the front fly method off of this dress to know what to do. This was a gift to me in more ways than one because it actually taught me how to do something in my sewing I would not have known otherwise. As much as I do not advocate wearing vintage garments as a clothing source, because such regular wearing without constant care and respect can render these old clothes torn, destroyed, and eventually non-existent, I do think it is important for everyone to handle, see, and experience at least some kind of old clothing on their back at some point. Just seeing such clothes confined and displayed from a distance in a museum does not have the same personal effect for people as being subjectively tactile with them. Find your local shop or resale boutique and enjoy yourself, open your mind to the new details you will see, and start trying things on! It might take awhile to find something that both fits and looks good on you, but find something that you absolutely love and care for it like a good friend. It will give you a whole new insight on the clothes of today, help any sewing skills you might have, and let you love yourself with a style as unique and individual as you are! If you are up to it, you can even be a hero or rescuer for some of the ones that need some tender loving care (see this ‘save’ of mine), or be the one to fill in the missing parts such as I did here. Finding clothes that earn your respect can help you wear attire which help you esteem your body shape as it is in way that I don’t see many modern clothes doing for the masses. This entry was posted in 1950's, 1960's and tagged 1950's, 1950s sheer cotton dress, 1950s slip dress, 1951, Advance 5552, Advance pattern, Marcy Lee Dallas label, Marcy Lee dress, retro, sheer vintage dress, slip, vintage, vintage dress by kellycb. Bookmark the permalink. I’m so glad you said that about the zipper in the slip- I have come into a vintage slip with the side zipper. It NEVER occurred to me to think about the size zipper in the dresses that I hope to make to go over it! I love your dress and its slip, by the way. The fabric patterns of yesteryear are one I really like, much more than those on modern fabric. These vintage patterns had such lovely details you hardly see anymore. I love the colours of your dress and you have picked a lovely colour for the slip. Nice work!